Today’s POP RESCUE from a obscure fate is the 1989 debut album Pump Up The Jam by Belgian act Technotronic but would this album be sweet and sugary, or was it more of a Marmite moment? Read on.. The album opens with the title track and huge debut single Pump Up The Jam. A phat synth and hi-hats usher in a thumping bass drum. Fashion model Felly Kilingi is soon in with this iconic 80’s rap/dance cross-over hit… except that she’s not – like Milli Vanilli, and Black Box, the ‘lead singer’ was actually purely for image, and the real vocalist Ya Kid K goes uncredited as vocalist. This is followed by second single Get Up (Before The Night Is Over) which isn’t so dissimilar to the previous song, although plays more on the bass line, and gives Ya Kid K the vocalist credit that she works hard to earn – rapping, singing and writing the song. This track reached #2 in the UK charts. Next up is Tough featuring rapper MC Eric, reminding me somewhat of 1987 hit Pump Up The Volume by one-hit wonders M/A/R/R/S, and to some degree a few 2 Unlimited songs. It feels slightly slower, and certainly isn’t as catchy as the previous two songs. This is followed by Take It Slow which starts with a nice little vinyl sample of some funky saxophone. This track sounds like it wouldn’t have been out of place on Neneh Cherry’s 1989 album Raw Like Sushi. The emphasis here is the vocals, with the familiar sounding bassy sounding synths taking second place. Come On is up next, and this feels far more pop than the earlier songs. Musically it’s quite simple and vocally it’s pretty sparse aside from a few shouty samples. This feels a bit like a filler. This Beat Is Technotronic follows, and acted as the third single, which sees MC Eric ‘take the microphone stand‘ and using his ‘dope lyrics’. The track gave them a #14 hit, their lowest charting position by that point, and perhaps that’s because there’s no Ya Kid K singing – it’s pretty much a repetitive rap over the familiar bassy synth and hissing hi-hat sequence. Up next is Move This, a fairly mid-tempo bouncy track, seeing Ya Kid K back on the mic, but her vocals and lyrics lack the power and catchiness of the earlier songs. This song was released as a single in 1992, charting only in the US due to its use in a Revlon television commercial. It was released as part of their Greatest Hits album, but also features in their Megamix hit single. Whilst it’s present here on this 1989 album, it certainly feels somewhat subdued in comparison. Come Back opens with that familiar bass synth again, and is swiftly followed by a number of shouty samples. A hi-hat arrives with a bass drum. Soon, a simple tinkling sequence follows with plenty more samples. This is like earlier song Come On – somewhat empty, and feels like a filler. Fourth and final single Rockin’ Over The Beat is up next, bringing us back to a catchy formulaic sound that they found great success with. This single took them back to the top 10 singles chart again in the UK, reaching #9. The song bounces along nicely, although Ya Kid K’s vocals aren’t as strong here. At 5m 50s it goes on, and thankfully had an edit for the single. Up next is Raw, with thumping bass drum, acidy snarling synths, and a familiar ‘ah yeah’ sample that infiltrated many hits in 1989-1990. However, again we’re faced by a simple, mostly vocally empty song, with occasional house ‘piano’ sections. 19yr old MC Eric returns for the penultimate track, Wave. Here he’s ‘makin’ music – chill!‘, and when he ‘says the word Techno’ he doesn’t want to hear no ‘heck no’. Clever huh? Sadly, the synths are somewhat uncomfortable, and Eric seems to be trying hard to make up for that shortcoming. Again, we’re left with a feeling of filler. The album closes with String (not sure where the glitter and sellotape went). A thumping beat is joined by scaling synth strings that sound almost like they’re trying to be the opener from Kylie Minogue’s What Do I Have To Do…. but then after a few old samples about America, you discover that it’s again devoid of vocals. This little 2m 56s track could have been as catchy as hell with a vocal over the top. Missed opportunity i’m afraid. Over all, this album is a bit of a mixed bag. The singles really shine here, and while the rest of the album probably sounded very fresh and exciting back in 1989 as dance-pop, house, and rap were just about to jump the charts, in 2015 these filler tracks sound simple, basic, and somewhat dull. I’d be interested to hear what the remix album sounds like, but wonder whether that might actually date it even more. Ya Kid K continued performing up until at least 2005 (according to her site), coinciding with Pump Up The Jam by D.O.N.S feat. Technotronic, which reached #22 in the UK chart. The group followed their first album’s success by releasing a Megamix which was a mix of their previous four singles. It gave them a #6 UK hit single. A few weeks later, they released Trip On This – Remixes with Hi-Tek 3 – essentially a remix album. Again, the fans lapped this up, and took it to #7 in the UK album charts. Ya Kid K also had a hit in spin-off project Hi-Tek 3 with song Spin That Wheel from the soundtrack to the Teenage Mutant Ninja Turtles (1990) movie. It gave her a #15 UK hit. By the end of 1990, the group were struggling to chart in the UK top 40 singles chart. Their second studio album Body To Body stalled in the album chart at #27, although did give them the #12 UK hit single Move That Body. In 2009, Ya Kid K and MC Eric reunited to tour Europe, South America and Australia to mark the 20th anniversary of Pump Up The Jam. A Best Of Technotronic was released in 2012, but it failed to chart in the UK. Pump Up The Jam rightly remains one of the most iconic dance/house/rap cross-over tracks, right there alongside Black Box’s Ride On Time. 1989 UK CHART PEAK: #2, certified Platinum. POP RESCUE COST: £4.05 from an eBay seller. 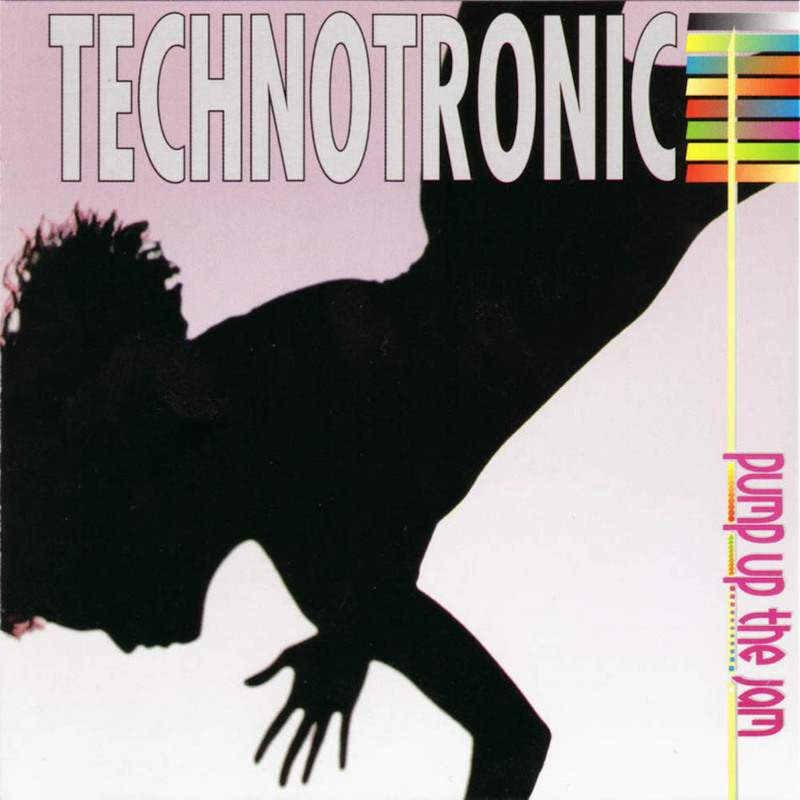 Posted in 1980s, TechnotronicTagged 1989, album, Felly, Get Up (Before The Night Is Over), MC Eric, Pump Up The Jam, rap, review, Rockin' Over The Beat, This Beat Is Technotronic, Ya Kid KBookmark the permalink.